Exit I-95 at Hypoluxo Rd (Exit 60). Go west for 2 1/2 miles. Pass Congress Ave and Lawrence Rd. When you get to Military Trail, turn left (south) onto Military. The Church is at 7900 S Military Trail, one block south of Hypoluxo Rd on the right. Exit the turnpike at Lake Worth Rd and go east. Go past Jog Rd. When you get to Military Trail, turn right (south). You will pass Melaleuca Rd, Lantana Rd and Hypoluxo Rd. The Church is at 7900 S Military Trail, one block south of Hypoluxo Rd on the right. Exit the Turnpike at Boynton Beach Blvd and turn right (east). Pass Jog Rd. When you get to Military Trail, turn left (north). Pass Gateway and LeChalet Blvd. 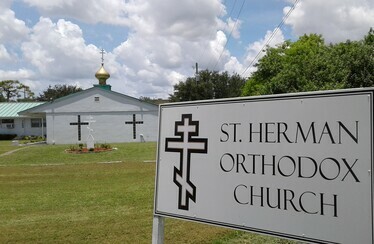 Just (1 block) before you get to Hypoluxo Rd, the Church is on the left at 7099 Military Trail. 6:30 PM Vespers and the hearing of Confessions. 9:40 AM Hours; 10:00 AM Divine Liturgy. Great Vespers and the hearing of Confessions.